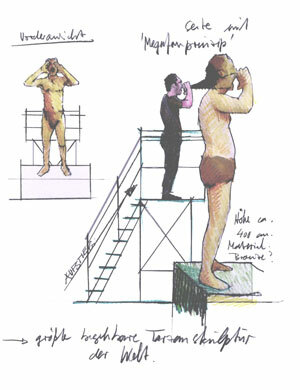 The sculpture will be approximately 4 metres high, made of bronze and the portrayal realistic. It will be erected at ground level, without a pedestal. The inside of its head will be shaped like a megaphone, using the shape of the hands as a sound-projecting bell, while the smaller hole at the back of the head will serve as an opening for the speaker (fig,01). 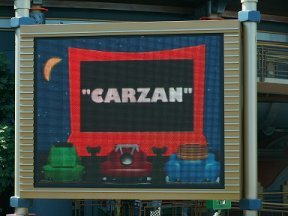 It is therefore possible to stand behind Tarzan on a small platform and call or speak through his head, the sound being amplified. 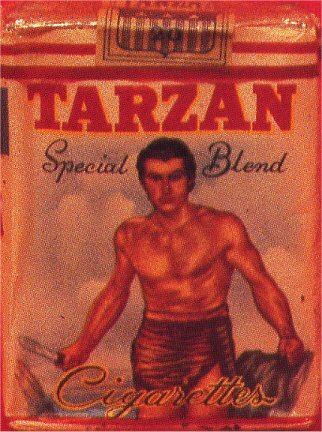 The depicted figure is built like an average man, no muscular superhero, a Tarzan like you or me. 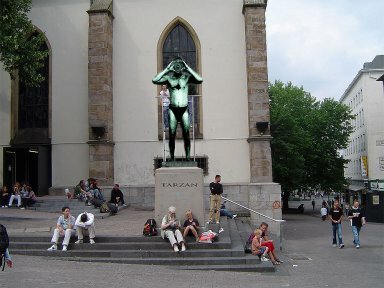 Otherwise, he is clearly identifiable as Tarzan, being barefoot and wearing a characteristic loincloth. 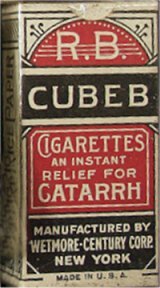 Edgar Rice Burroughs liked to smoke cubeb cigarettes. As a student at Harvard School in Chicago during 1888, he and a friend felt quite devilish when they snuck down to the breakwater to smoke. Burroughs didn't study English, but Latin and Greek. Later in life, the famous creator of Tarzan was asked to reminiscence for a school yearbook. 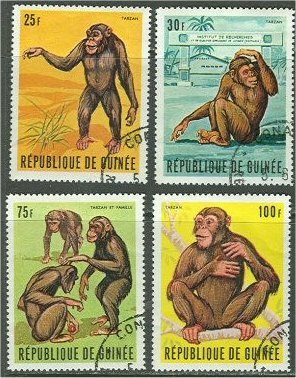 Tongue-in-cheek, he stated that if he had studied English grammar, and had not smoked so many cubebs, there might never have been a Tarzan. Marshall's Prepared Cubeb Cigarettes (1881-1940s) was a popular brand with enough sales to still be made during World War Two. 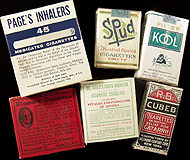 Blosser's Cigarettes, Dr. R. Schiffmann's Asthmador Cigarettes, and Requa Cigarettes were also non-tobacco medicinal brands smoked as a treatment for asthma and other bronchial problems. has published the reminiscences of several former students. 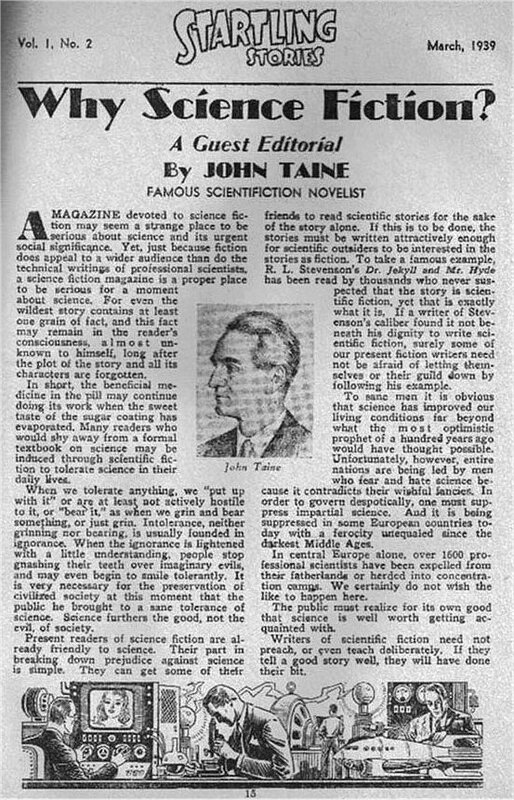 We reprint one below... Because I attended Harvard School sometime between the Pliocene and Pleistocene eras, Miss Schobinger has suggested that I write a little article for the School Annual and call it Before the Birth of Tarzan.... It was in 1888 that I entered the old Harvard School at 21st Street and Indiana Avenue, where my brother, Coleman, had been a student for a year. I was never a student -- I just went to school there. I lived over on the West Side where everybody made his money in those days and then moved to the South Side to show off. I kept my pony in a livery stable on Madison Street west of Robey Street... and in good weather I rode to school. In inclement weather, I took the Madison Street horse-cars to Wabash, a cable-car to 18th Street, and another horse-car to school. Sometimes, returning from school, I used to run down Madison Street from State Street to Lincoln Street, a matter of some three miles, to see how many horse-cars I could beat in that direction. It tires me all out even to think of it now. I must have been long on energy, if a trifle short on brains. Bennie Marshall and I used to sneak down to the breakwater and smoke cubeb cigarettes and feel real devilish. I imagine we even chewed gum too. He became a very famous Chicago architect (with Charles Eli Fox, he designed the Drake Hotel). I can see him now sitting at his desk drawing pictures and chewing his tongue when he should have been studying. There should be a moral to this. Perhaps it is that one should not smoke cubeb cigarettes. Cubeb (kyu'beb') Oil A tropical southeast Asian shrubby climbing vine (Piper cubeba of the pepper family Piperaceae) having spicy, berrylike fruits, heart-shaped leaves, and small flowers in cylindrical spikes. The dried, unripe, berrylike fruit of this plant, used in perfumery, pharmaceuticals, and commercial flavorings. This species is native to eastern India and Indomalaysia. The crushed berries are smoked, and the inhaled smoke produces a soothing effect in certain respiratory ailments. Cubebs are used in medicine as a stimulant, expectorant, and diuretic. Medicinal properties of cubeb are due to the presence of a volatile oil which formerly was thought to stimulate healing of mucous membranes. 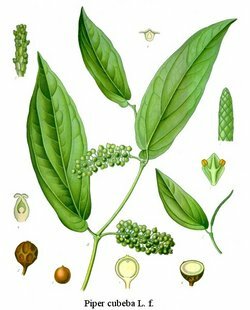 The dried, unripe, berrylike fruit of this plant, used in perfumery, pharmaceuticals, and commercial flavorings. with Lex Barker's image on the pack. 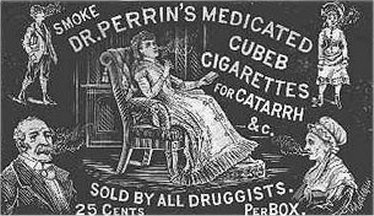 Medicinal, nontobacco cigarettes were sold under a wide variety of brands until about mid-century for asthma, catarrh, and hay fever. 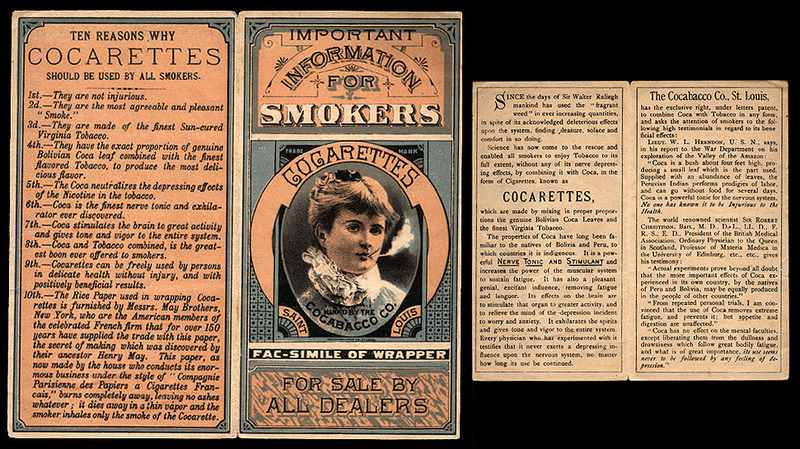 Shown are Dr. Kinsman's Asthmatic Cigarettes, R.B. Cubeb Cigarettes, and Blosser's Cigarettes. The woman in the above ad is smoking a Cocarette cigarette, which is a tobacco and cocaine mixture made by Cocabacco Co. of St. Louis. 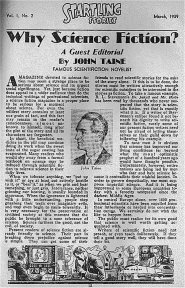 The package displays much testimony as to the benefits of the combination by a U. S. Navy Lieutenant, the president of the British Medical Association, etc." ...proper proportions the genuine Bolivian Coca Leaves and the finest Virginia Tobacco." There is a list of 10 reasons to use Cocarettes including the suggestion that Coca neutralizes the depressing effects of the nicotine in the tobacco. Also touted is the use of May Bros. rice paper rolling papers which leave no ash. 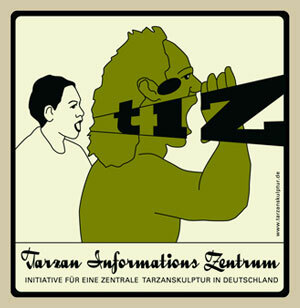 "Tarzan" who was a Guinean Chimpanzee with superior intelligence and Ability. 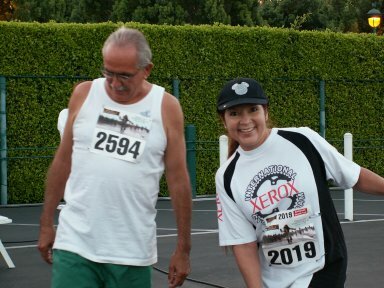 Edie ran the Disney 5K Family Fun Run last Sunday and we stayed over Monday to visit the Happiest Place on Earth. 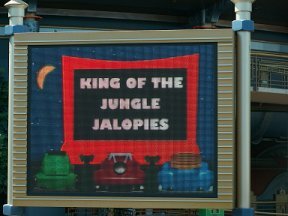 I captured the following from Autopia's little light board. 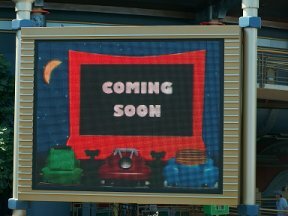 Here is one of the coming attractions. 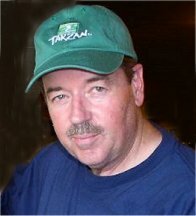 In 1986, Mike Searle was on holiday in Kenya after graduating from Northwestern University. On a hike through the bush, he came across a young bull elephant standing with one leg raised in the air. The elephant seemed distressed, so Searle approached it very carefully. He got down on one knee and inspected the elephant's foot and found a large piece of wood deeply embedded in it. As carefully and as gently as he could, Searle worked the wood out with his hunting knife, after which the elephant gingerly put down its foot. The elephant turned to face the man, and with a rather curious look on its face, stared at him for several tense moments. Searle stood frozen, thinking of nothing else but being trampled. Eventually the elephant trumpeted loudly, turned, and walked away. Searle never forgot that elephant or the events of that day. Twenty years later, Searle was walking through the Chicago Zoo with his teenaged son, Jack. As they approached the elephant enclosure, one of the creatures turned and walked over to near where Searle and his son Jack were standing. The large bull elephant stared at Searle, lifted its front foot off the ground, then put it down. The elephant did that several times then trumpeted loudly, all the while staring at the man. Remembering the encounter in 1986, Searle couldn't help wondering if this was the same elephant. Searle summoned up his courage, climbed over the railing and made his way into the enclosure. He walked right up to the elephant and stared back in wonder. The elephant trumpeted again, wrapped its trunk around one of Searle' s legs and raised him high into the air and slammed him against the railing, killing him instantly. 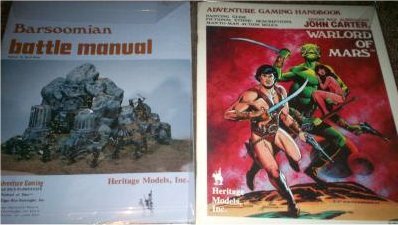 Two 1978 game rule books published by Heritage Models Inc. based on Edgar Rice Burroughs' John Carter, Warlord of Mars. 1. 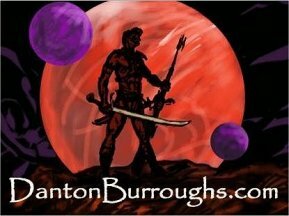 Barsoomian Battle Manual written by Scott Bizar with rules for Barsoom adventure gaming. 2. Adventure Gaming Handbook with painting guide, fictional ethnic descriptions, and man-to-man action rules. I live in Erie, Pennsylvania and I was visiting a pet cemetery yesterday. I ran into a man who told me that Bonzo the Chimp is buried here and showed me the mausoleum?sp? he is in and that he became ill in our town and died while passing through and here he has been since! Do you know any solidity to that? 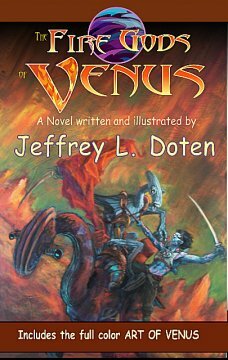 I thought you might be interested in the brand new official Thomas Yeates website at http://www.ThomasYeates.com. We included many of his ERB and Tarzan artwork and will update the art portfolio from month to month. 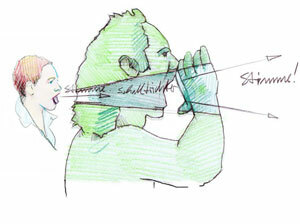 In afew weeks Thomas will offer original art tu buy online. 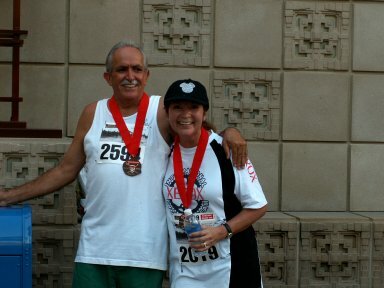 So it would be nice if you can help to spread the word about ThomasYeates.com.